To apply to either program, all applicants must attend an orientation at the Zoo (no RSVP), on either Sunday, February 24th or Saturday, March 2nd from 1:00pm to 2:00pm. We encourage parents/guardians to attend along with the prospective volunteer. Please email youth@sfzoo.org or call 415-753-8123 with questions. Learn how to handle livestock, insects and more, while giving informational talks to Zoo visitors. Utilize biofact carts to educate the public. Interact with children in our Zoo Camp program. 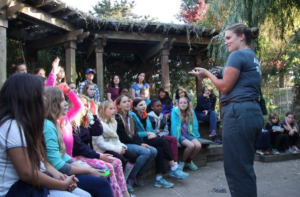 Help kids explore the world of animals through Zoo tours, crafts and games and assist Zoo Camp teachers with activities. Gain practical work experience with children. OTHER INFO: To apply to either program, all applicants must attend an orientation at the Zoo (no RSVP), on either Sunday, February 24th or Saturday, March 2nd from 1:00pm to 2:00pm. We encourage parents/guardians to attend along with the prospective volunteer. Please email youth@sfzoo.org or call 415-753-8123 with questions.